It is rare for a work day to go by for me without a conversation that includes the phrase new business models. 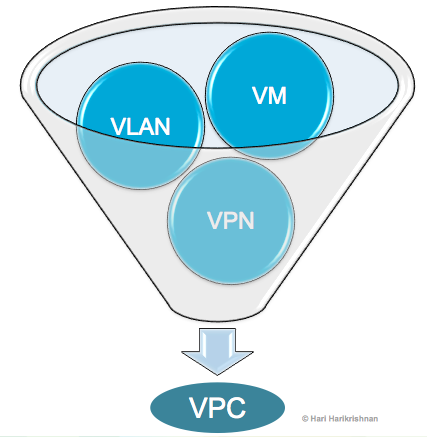 That phrase is often surrounded by other phrases du jour such as cloud, virtualization, consumption etc. Throw in XaaS and the day is complete. 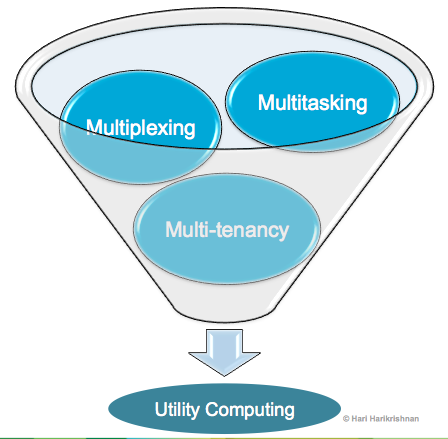 XaaS could mean SaaS, PaaS, IaaS, BPaaS etc. or Blue-Sky-as-a-Service. And don’t you dare abbreviate Blue Sky, lest you incur the wrath of the Anything-as-a-Service devotees! So, how many new business models – ways in which firms generate revenues and capture value – are there really? Are these business models really new or new instantiations of the old? I’ll talk about business models by simply focusing on how firms predominantly generate revenues, ignoring other strategy elements that sustain competitive advantage. Let’s look at two business models from titans in the industry: Apple & Amazon. We’ll focus on their primary business model: Amazon, a provider of services (retail or Amazon Web Services); Apple as a seller of products. Based on their primary business model, let me place them on two ends of a product-service spectrum as shown. Apple and Amazon both sell tablets, but for different ends. iPad directly generates revenues and profits for Apple whereas Kindle is a loss leader for Amazon, pulling through sales of physical goods as well as virtualized goods like e-books, movies etc. Trust a 21st century retailer to use an electronic tablet as a loss leader! Let’s map a few more firms to these quadrants using this framework. Naturally, some of these firms do not restrict themselves to one of these quadrants. However they derive bulk of their revenues and profits from the quadrant they are placed, while using other quadrants to support that core business. 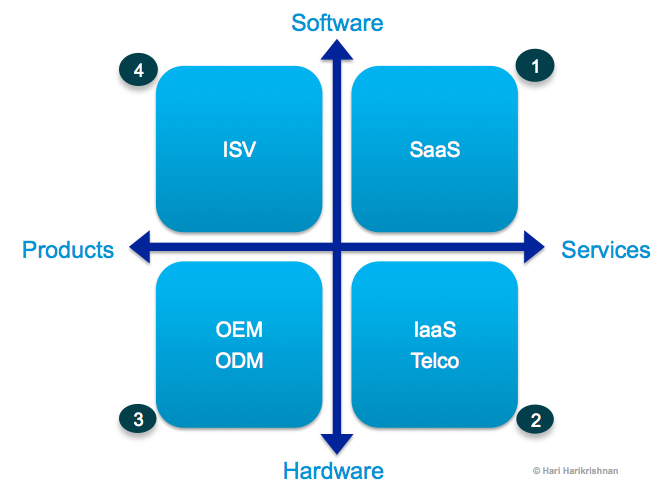 This Product-Service-Software-Hardware plane will come in handy in some later topics. We’ll refer to this as the PSSH plane. (Well, it is more pronounceable than WYSIWYG web page editor!). How about generalizing the business model of the firms that fall in each quadrant of the PSSH plane, as shown? 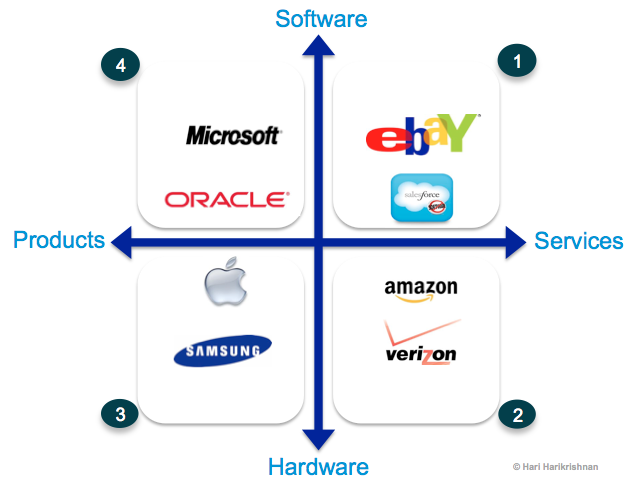 Can you map your favourite technology firms to the quadrants on the PSSH plane? Try it. This is not meant to be an exhaustive list of business model categorizations. We can fill the page with quadrant 1 alone. Hopefully it helps to simplify all those fancy water-cooler conversations about new business models. Time to go back to discussing last night’s game or that new HBO series? Not yet. Are there new business models in the technology industry? Is Cloud Computing helping to create new business models or is it simply helping to rehash existing business models, although more efficiently? Looking at the PSSH plane, the answer is no to entirely new business models. We see variations of a few themes in each quadrant. So why all the excitement about Cloud and new business models? I believe, the answer lies in understanding who competes with who in the PSSH plane? 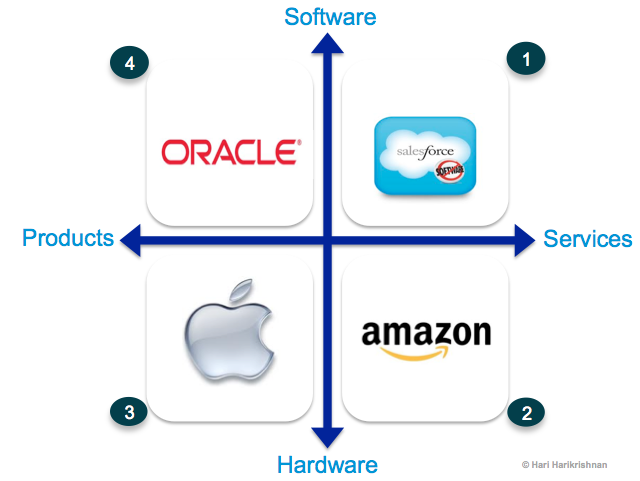 It is obvious that firms that fall in the same quadrant compete if they are selling products in similar product categories. Apple-Samsung competition is a prime example. However, firms with different business models compete as well. It gets interesting when firms in quadrants 1 and 2 compete with firms in quadrants 3 and 4. We see this competitive dynamic in consumer markets between Apple, Amazon, and Google; in enterprise software markets between Oracle, SAP, Salesforce.com etc. This is where Cloud Computing hits home. Traditional competitive boundaries blur. Customers have more than one way to get solutions to their problems. That means firms must adapt. It is no longer enough to diversify product or service portfolios and stay in the same place in the same quadrant as one has done in the past. Market adjacencies could be a quadrant away. So, considerations should be given to business model diversification. Firms may need a portfolio of business models to provide flexible offerings; either to defend their existing market positions or to capture new markets; either offered by them or in partnership with others. It is going to be a scrappy decade ahead for Information Technology firms. The new conversation at the water cooler is on whether we should diversify our business model portfolio. Capiche? Or should I say caPSSH? See Part II of this post on how Cloud (or the Internet, to be old-fashioned about it) is effecting changes in technology consumption.